And there was just one more left now – The sight of the first rays of the sun enlightening the Neelkanth peak – Hopefully, this too would soon be turning into a reality in a few hours from now… With these thoughts, I closed my eyes and went off to sleep. Cold had gripped me tight, no amount of warm coverings providing any sort of comfort. Sleep was something that eluded me that night. Morning greeted me with cold burns all over my face and a very very stiff body. Anticipation helped me loosen up my body a bit; to add to that, the enthusiasm of my brother who was already out of the bed and raring to go was mighty infectious too. I somehow managed to get out of the multiple layers of quilt and dragged my feet out of my room. Having read a lot of stories of how people craving for one sight of this ‘Garhwal queen’, and despite being in Badrinath for over a week, have had to return back disappointed… I couldn’t help but wonder… Will we be witnessing the sight that has dodged millions before us…? It was still dark outside. No sign of a single soul out there, no movement – just me overloaded with 2 (or was it more?) thick blankets and my brother, wearing just a jacket (!). Though this was something we both had been eagerly looking forward to, even before the trip began, I must admit, that today, he was more excited of the two of us. The first rays of the morning sun slowly wiped away the mist… transforming a lifeless stone into a glittering jewel…in its pristine glory! 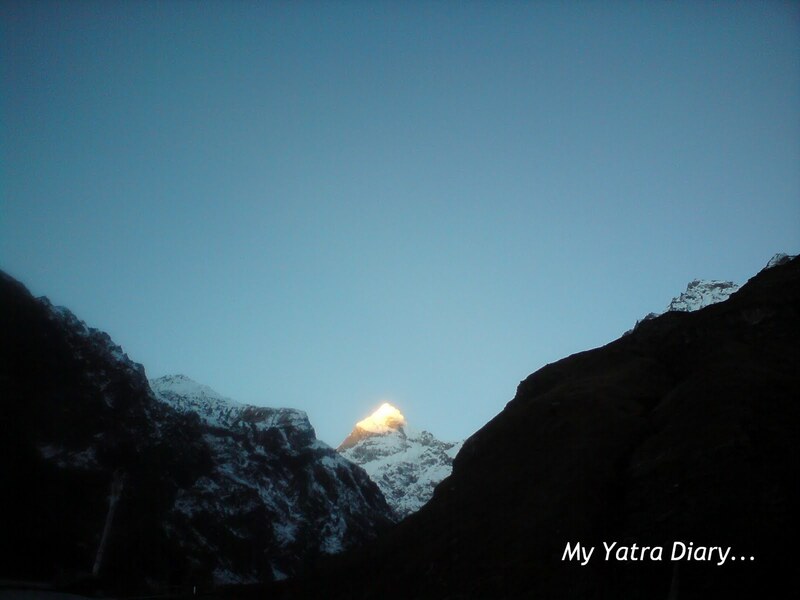 The cap of the great mountain lit up, like those lamps of the Diwali festival… Diwali in Badrinath was not yet over…! Nature’s celebrations had just begun! Wow!! That looks like really really wonderful sight! WoW!! WoW!! The rays lightening up the peak! You have been really lucky to capture that wonderful scene! Fantastic pictures! What a sight! Thank you for sharing it with us! I am fine, so glad to see you here after a long time. What fantastic photos you captured,Arti! You were so lucky to encounter the sight. Thank you for sharing those interesting photos! What a gorgeous sight! And your captures are superb as always, Arti! Terrific post for the day and a great start for mine! Hope your week is going well! Oh Wowwwwwwww....Such amazing pictures! Love the glistening Neelkanth Peak. Lucky you! So amazing that peak in the sunlight - just magical! Those snow capped mountains glisten so Arti! I couldn't take my eyes off them for a long time. Truly said, some spectacles are too much of a spectacle to put in words. :D Beautiful post! I love seeing sunrises and sunsets. And this is truly the most unusual and stunning I have seen!!! How exciting, Arti! 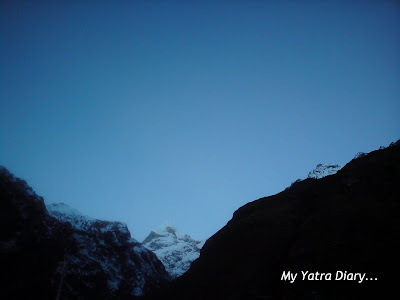 I felt my heart racing a bit as I looked at your sequence of gorgeous dawn photos of the Neelkanth Peak. I am awed just as you were. Fantastic!!!! I remember seeing this one! Arti, this is something really magical, only wish you had a little underexposed the shot by a stop or two. 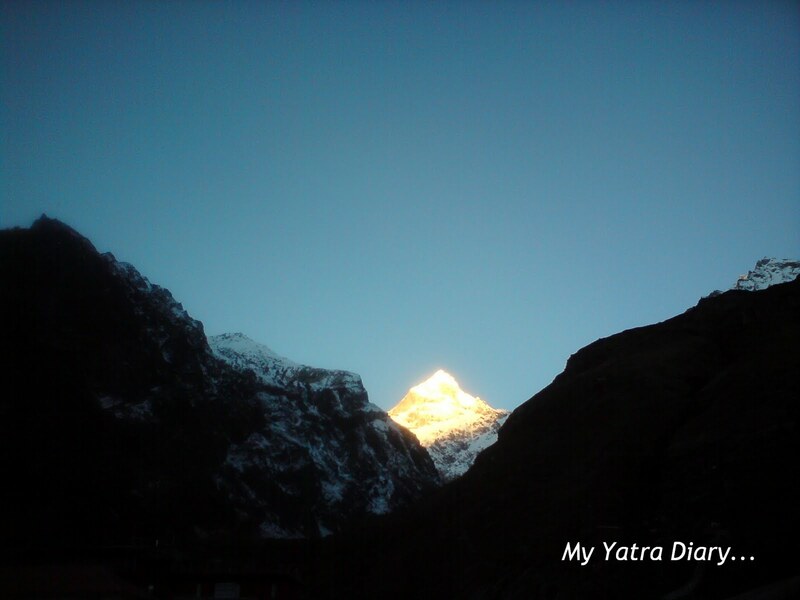 Just a doubt - Is this peak visible from the Badrinath town or you need to move out anywhere? Hey.. they are really wonderful sites.. The snaps of the Neelkanth peak glowing in sun light made my jaw drop. Amazing! Thanks for sharing! Wow. What a great nature sunlight. Wow, Fabulous shots. I would like to visit this place. 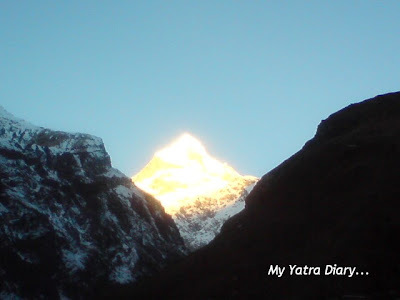 Aarti ji your blog reminded me of the journey to Kedar Nath. We could not visit Badrinath that time because of land slide and road blokage. The pictures Of Neelkanth peak are excellent. Thamks for visiting my blog. You are lucky to be able to see majestic peek like big diamond. Though your blog I could hold Himalayan mountains in awe. I want to see it really. 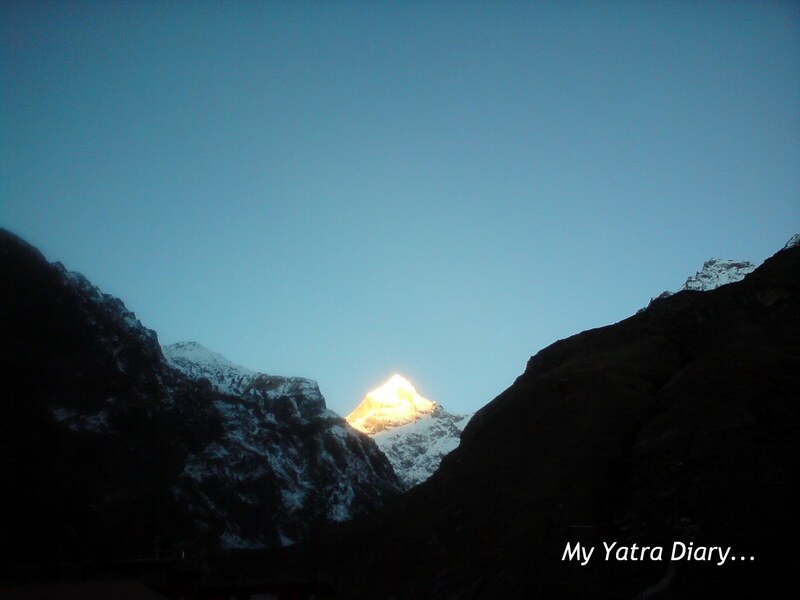 Thank you for sharing Neelkanth Peak. Aahhh yes, got up before 5am, stood in the freezing cold. It was worth it! Was too stunned to take any photos. Thanks very much for these pictures which brought back wonderful memories! I am really a very amateur photographer without any technical knowledge hence the underexposure thing!! 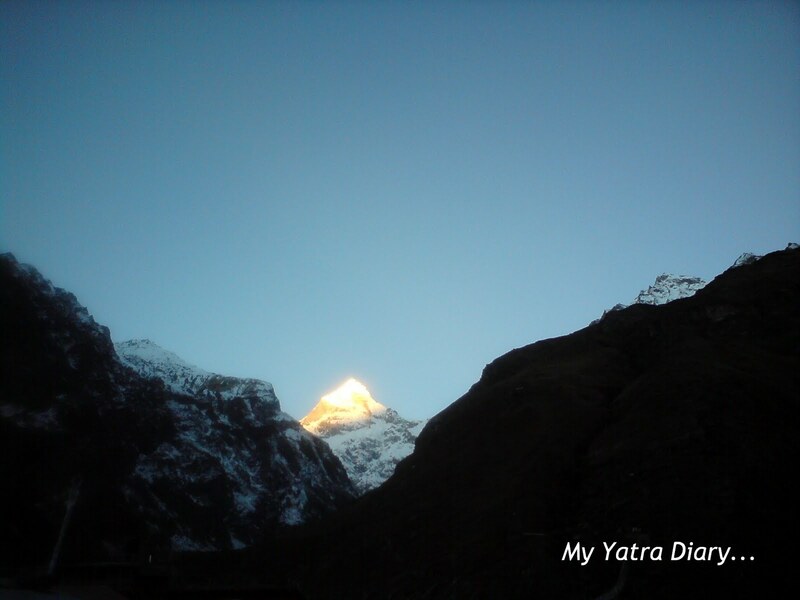 this is magic, seeing the glow of the sun on Neelkanth Peak. you are blessed to have witnessed it. I love how you relate to us the cold, and your face burns, etc. nicely descriptive. I'm having some trouble seeing the elephant head - I actually think the peak on the right looks like it! but I'm delighted to look at your wonderful photos. you've just added to my desire to make this trek and I very much appreciate your sharing this journey with us Arti. I hope you have a fabulous week. THANK YOU FOR COMING TO VISIT and this is quite an amazing chronicle of a journey rarely taken by most people! The tranquility, the pain, the AWE and the challenge....not to mention the COLD!!!! This is amazing. One can most DEFINITELY gain a lot of INSIGHT and retrospective musings from such a trek!!! BRAVO!!!! What beauty and you captured it so well, thanks for sharing. arti, if i will go on a trek to the indian himalayas, can you suggest a good tour operator? and what is the best time to go? Wow , lovely sight . Since I havent been to trekking in the Garhwal Himalayas, I am afraid I wont be able to be of much help to you in this regard but you could check out with the GMVN tour operators run by the Government of Uttarakhand for more details and assistance on this. When is the best time of year to trek in the Himalayas?
. Hope this helps you in some way. Oh! wonderful and charming pictures. Many many thanks for your kind visit on my blog. Arti, your words made me feel as if I were there with you, waiting for the moment holding my breath and standing in awe. 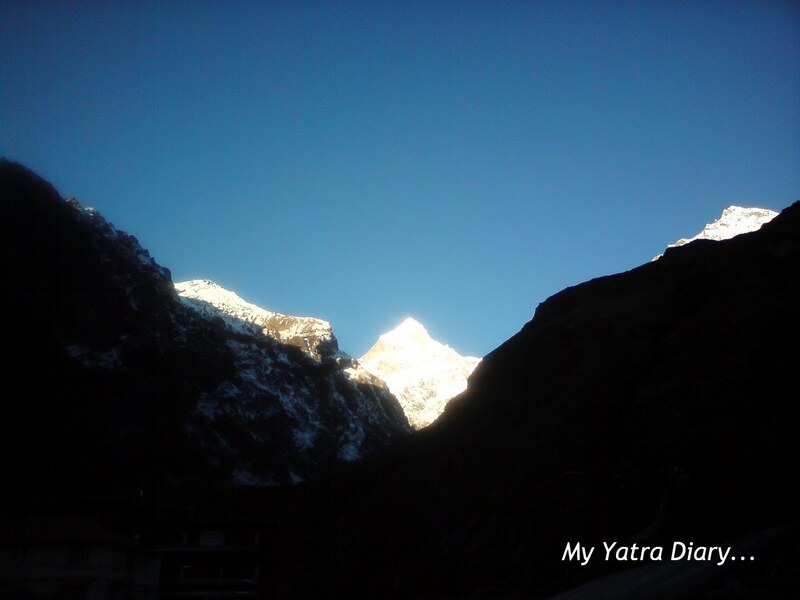 Neelkanth Peak sparkling in the morning sun is no comparison with any jewels. Thank you for sharing this wonder of nature, or manifestation of God. Have a nice weekend. Thank you for your comment and reminder to see this. I just missed it on the dashboard...But couldnt have missed it permanently as I keep on reading your postings. Awesome photo. In may trips to Badrinath , Nilkanth was always cloud bound and could never see it so far. My trips were always in deadly monsoon time as that is the time to go to Valley of flowers. October/Nov is the best time to see Nilkantha. I saw Frank Smythe's name, have you read his book " The valley of flowers"...? Now I guess you are concluding the great Jatra! So I am going to read from the 1st episode. Have a nice weekend and thank you so much for this great treat. Truly mesmerizing sight!!!! You are very lucky indeed to visit such nice places!! Fantastic shots ~ can't stop staring :) Spectacular n mesmerizing! Breathtaking pictures. Oh the splendor of God's creation! wow...fabulous shots of an amazing spectacle!!! it reminds of sunrise at tiger hill darjeeling...it was such an amazing feeling waiting and then within 3 minutes the sun rose and it was mother nature' way of saying....that she is the best director of them all!!! I loved the photos, haven't read the blog yet though :) cheers!! Wow - what a stunning peak! Such glorious photos. The mountain peak is just amazing! You were certainly there at the exact right time , and thank you for getting up early for that -- and for sharing it with us. I didn't see the Elephant God in it, but I am sure some did. What a wonderful transformation you witnessed. 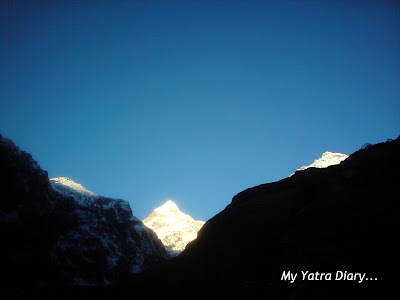 The Neelkanth Peak is really amazing. Thanks. The mountain top does appear lit up as the surrounding terrain remains in shadows. Very nice. Thanks for visiting earlier. I hope you will stop by again soon. A wonderful post and delightful photos. Thanks for stopping by. that view was well worth getting up early for! fabulous shots. It must have made the hair stand on the back of your neck as the saying goes. What a wonderful sight but oh how cold. Lovely prose too. The photos of the sunrise light hitting the mountain are fabulous. I'm sure it was worth getting up for. I know you had a never-to-be-forgotten experience. Wow! Outstanding photos! I can well understand how the image might have held you transfixed and gaping in awe! Amazing images! I bet it was a beautiful sight to see in person. regarding it looking like ganpati, since you mentioned it, i looked for it :) and i think the 2nd last pic is the closest! @Ushnishda Thank you very much for the appreciation. I have heard of him too in connection with the Valley of Flowers but have not got a chance to read his book. Will try to get my hands on it some time soon! 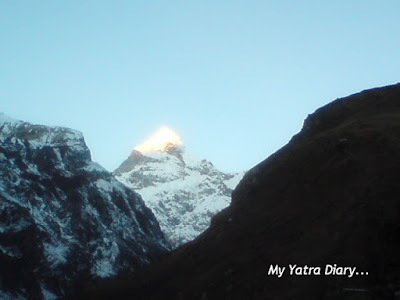 Yes, the yatra is about to conclude in a few posts from now..
@Sallie Yes, it’s a bit difficult to figure it out especially with the sun lighting it up so brightly but Ms. Becky and magiceye did manage to see it. Oh..... so nice your pictures! Thank you very much for your kind words about my blog. I wish you a happy week and send you a lot of greetings from Switzerland. Superb pics, post & place. Would love going this place as many times as I can, in the future. It was wonderful to meet you and discover your blog. What a breathtaking sight and one you will remember always. I love the sun shinning on the peak and the blue sky. Many thanks for visiting me. you have a lovely blog…I like your writings and words...Please check out my blog.I am having a Giveaway in my blog..Please check it out and partcipate in that..
Hello Arti, I stumbled upon your site today while looking more deeply into the various places I will be visiting this October on the yatra my Teacher is leading "In the Footsteps of Ma". I just wanted to thank you for the insightful and beautifully-documented posts! Those mountain peak shots are absolutely unspeakable. I will surely be returning for more. I love this post. You always make us feel as if we are right there with you. Well, except for the cold. It's unbelievably hot here in Miami right now. Thanks for sharing your adventures with us. My heart missed a beat scrolling down! Thanks Arti! Any adjective is small to describe such beautiful pics. They are divine! OMG!! you are a genius!! this was AWESOME. Truly AWESOME Arti Di!! the first one i commented after being totally blown over by the photos. Nature's Diwali?? oh YEAH. only that this is a much much more beautiful and pristine form of that. And i totally agree with Mr.Smythe. This peak is truly beautiful. Never been to this place(my relatives have though) but seeing these pictures kinda makes me think about dropping my idea of becoming a professor and take up travelling!! there is so much beauty is your photographs Arti Di!!! That must have One Amazing Spectacle Arti!!! If the snaps are so impressive what would it be like to watch that in person!!!! Nice to have you back after the break Arti...and I had been on a short one, unintended though. Glittering jewel indeed. I just 'have-to' thank you for that amazing sight. Great post, great pictures. awesome, mesmerizing, nature at its best..lovely pics and post. Thanks for sharing. What a spectacle Arti!! It must be one unforgettable experience right? I have seen this personally and you blog and pic reminded me of that time. superb view...must be amazing to see the sun shining on the snow clad peak..
i'm planning my trip , this december but i have no idea how to reach there as i'm confused bewtween the neelkanth temple and neelkanth mountain? do both have the same history about the venom which shivji drank? and is it possible to trek there as i have no trekking experience .